Dr. Vijaya Surampudi is an Assistant Professor of Medicine in the Division of Human Nutrition and work in the Center of Obesity and Metabolic Health (COMET). She is a Board Certified in Internal Medicine, Endocrinology and a Physician Nutrition Specialist. 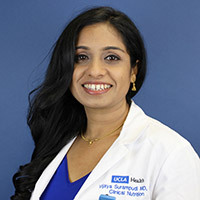 Dr. Surampudi is also currently the Assistant Director of the UCLA Weight Management program (RFO) and supports the multidisciplinary bariatric surgery group as a Bariatric Endocrinologist. Currently, Dr. Surampudi's primary areas of practice are treatment and prevention of obesity and obesity-associated diseases. Her practice focuses using nutrition therapy to help treat and prevent pre-diabetes/diabetes, high cholesterol, hypertension and weight management. Eating lots of brightly colored fruits and vegetables, whole grains and cereals, and beans containing phytochemicals may decrease the risk of developing cancer, diabetes, hypertension, and heart disease.